So it's all come to this – after ten years, 18 movies, one of cinema's most important chapters, at least from a business standpoint – comes to a close (?) this weekend. The Summer Movie Season makes yet another leap forward in the calendar as Marvel claims yet more space for its world-bestriding project. Throughout the last few waves of the Marvel Cinematic Universe, little hints, dribs and drabs, have been released that hinted at the ambitious direction of these films. Mostly insidery and “did you catch that?” moments, they pointed towards the events that are coming to the screen with Avengers: Infinity War, as the intergalactic supervillain Thanos arrives properly, and Marvel and Disney round up basically every superhero they have available to them throughout their enormous series of comic book films. Moving from standalone films to crossovers like The Avengers was one thing, but this smashes together the entire universe in a way never seen before. The plot, well, I won't bore you with the plot because while a lot of these films have doubled as slightly heightened action movies, over the last few films they've gotten Very Comic Booky Indeed. Infinity War is the payoff for all the bits about the glowing stones you've seen throughout a bunch of these films, and all of those end credit scenes that someone told you needed to stick around for. Thanos arrives on Earth in search of the Infinity Stones, which when he has a full set of them, will basically allow him control over all creation and/or to undo all of it. Cue everyone from Iron Man to Black Panther, and even bringing in the oddball characters from Guardians of the Galaxy to save the day. As a project, it's hard to overstate the madness of expecting to launch 18 films all leading up to one and keep it as a coherent story. What's more impressive is that they've never really stumbled beyond the most extraneous of the films, The Incredible Hulk, and which launched before the scope of these films was really evident. Starting with The Avengers, which served as proof of concept of the greater idea here, it has been an unbroken string of box office hits, even for things like Ant-Man, and especially in the case of Guardians of the Galaxy and Black Panther, two properties I bet 98 percent of non-comic readers could not have named prior to this whole endeavor kicking off. Collectively, these films have earned almost $15 billion, and the pace is only increasing. The aforementioned Black Panther is now the third highest grossing film in the domestic market of all-time and is the main reason there's any question about whether Infinity War will be the top film of 2018. The film is almost incidental at this point, as it's ridiculously doubtful that anyone could be motivated in either direction by reviews, as positive as they may be. The ads have been... adequate, mostly serving to show that all of the significant characters are present, with a lot of the weird snarky humor the Marvel films have been known for, along with hints at some rather significant character developments and consequences (there's a reason that Avengers 4 subtitle has been hidden). 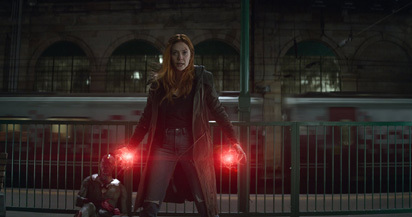 Directorial duties have been handed over from Joss Whedon to the Russo Brothers, who are officially the torch carriers of this franchise now. The big question here is whether it's going to threaten the all time record of $247 million opening weekend, earned by Star Wars: The Force Awakens. When we get into these rarefied airs of these mega openers, just about anything is on the table, and steamrolling effects often come into play. We're almost going by feel at this level, and the hype levels are high but not off the charts here. I don't think this catches the quantum leap in opening weekends that Star Wars created, and we should see an opening weekend of $235 million. While Infinity War is going to swamp most of the box office this weekend, there's still a few returning films of significance. A Quiet Place is the rare horror film that has shown legs, having dropped just a cumulative 60 percent from its opening weekend, retaking first place last weekend and is already threatening the expectations of three times opening weekend as a final total. It's already had a sequel greenlit, so watch for this new idea to be ground into dust, but for now it should earn about $13 million this weekend. Rampage slid back to second, with the Dwayne Johnson/CGI monster fest looking like it's going to earn about $110 million domestic. Its legs were ... OK ... but it should likely suffer in comparison to this weekend's big release, and earn about $11 million. I Feel Pretty outpaced a lot of the cynicism about Amy Schumer's career to open to $16 million – not a great number, but not the bomb a lot of people seemed to be rooting for. As a comedy, it's likely to see a sizable drop, but should still manage about $9 million this weekend. Super Troopers 2 shocked the world with a day one first place finish against another new film and the two strong films at the top of the chart, leveraging 4/20 into a hot start. It had no way to follow that up though, and the Broken Lizard film had one of the worst inter weekend multipliers ever at 1.91. This points to a massive, *massive* second weekend drop off. I'd look for about $6 million this weekend, but for a crowd-funded film that's already earned back its budget in one weekend, it's hard to judge too harshly.